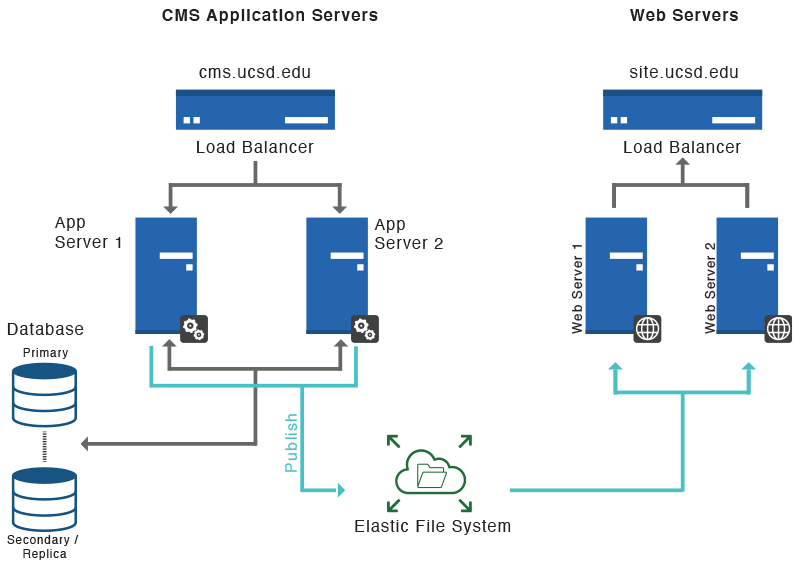 Read about some of the benefits of using the campus content management system (CMS). The CMS puts content ownership back into the hands of the subject matter experts, eliminating the IT bottleneck and ensuring content is timely and accurate. The CMS is hosted in the IT Services Datacenter. By consolidating website hosting, we reduce the need for additional campus servers. And you don't need to purchase software or pay for website hosting. By law, we have to be accessibility compliant. The CMS has checks to make sure your content complies with the ADA. All CMS content is hosted at UCSD and in the Amazon cloud so if there's a power outage or disaster, you're covered. In case of an incident, an emergency banner will deploy to let folks know what is happening and what they need to do. This means your site will look great on computers, tablets and phones. The layout automatically conforms to the device accessing your site. The campus CMS is integrated with the campus Single Sign On (SSO) system and uses your business systems account. All CMS sites get their own search collection via Google Site Search. See how many people are accessing your site with direct access to Google Analytics. The Campus Web Office provides CMS training and ongoing technical support. Just email wts@ucsd.edu. The campus CMS is integrated with the campus Single Sign On (SSO) system and uses your business systems account. Once logged in, users will be able to work within the CMS for a period of eight hours before their session times out. After eight hours of inactivity, a user will be prompted to log back in with their business systems credentials. Access to a website is maintained in AccessLink by the CWO. Website owners should send email to wts@ucsd.edu to request new users to be added. It is possible to have two groups of users with different publishing rights in the system. One group can be restricted to publish only to staging. The other group could be given the ability to publish to both staging and delivery (the live site). This is helpful if you want one group of people to edit and create new content and the other group to review and publish the content. IT Services provides a website hosting service for sites maintained in the CMS. ITS uses a Web server cluster to propagate content across multiple physical servers. This maximizes uptime in case one of the servers becomes disabled for any reason. The web server cluster runs Apache and exceeds the specifications recommended by Hannon Hill for the CMS.